Last weekend I was lucky enough to go to the Edinburgh Yarn Festival, and even more priviledged that I could get there by a short bike ride along the canal. I was truly humbled by the number of visitors who had travelled for hundres and sometimes thousands of miles to get there! I spent a lot of time during the festival tlkaing to people about my doll-making and my next burst of posts will be sharing what I learnt and who I met. So, first up is Uradale Yarns. 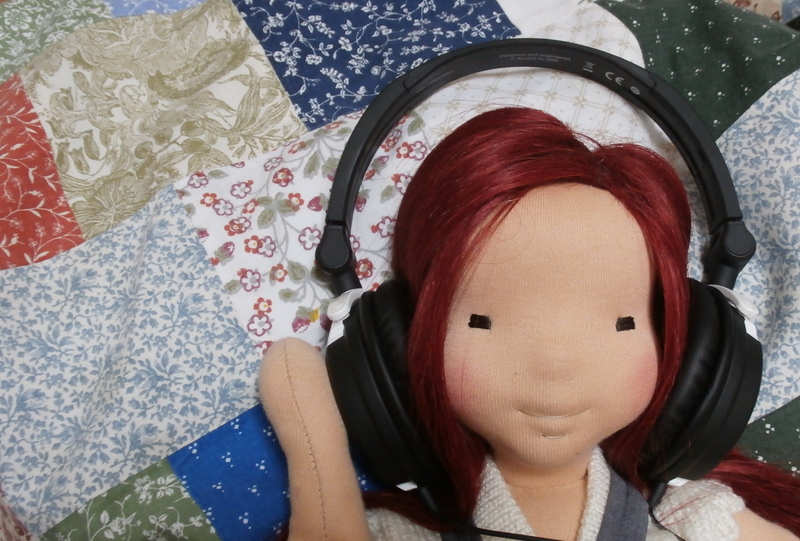 I would like to use more locally-sourced materials in my doll-making (where possible) so I was on the hunt for some British yarn that I could settle down with and hopefully use (eventually…) with my CE certified dolls (still working on this one…). Uradale Yarns are from Shetland and use organic native Shetland wool is some beautiful rich colours. I bought a ball of navy blue DK yarn from them and started knitting with it immediately in the cafe. I loved the feel of it, the crisp texture and clarity of colour, and I went straight back to buy another five colours. So here is my first experiment with this lovely yarn, a button cowl for a doll. Being double knit it is quick to wokr with and gives a chunky look at doll-size. I’m not sure who will finally get this cowl, Henny is only modelling it, perhaps I’ll make hat and gloves too and they can go to the new red-head (Abigail) I’m finishing off at the moment. Both Henny and Abigail came to the Yarn Festival with me and they caused quite a stir! Watch out for my next posts to read what they got up to there.